DumpsManny’s ’56 convertible is a true classic and its elegant colors give the American classic a distinctive look that caught our attention. Once we were past the “ah factor,” we checked out his custom trunk setup that got us talking about how hydraulics should be. “indio” installed a custom setup that’s as unique as they come. Two custom pesco 779 hydraulic pumps were made. These newer tailgate pumps were designed to be “gravity feed” like the original pesco pumps. The pumps feature a vintage reservoir that feeds the exposed #6 pump head. The cosmetics include four modern faucet-style slow-downs incorporated into the #8 stainless steel tubing, which was plumbed by igarashi and “superman” of craps hydraulics in whittier, california. 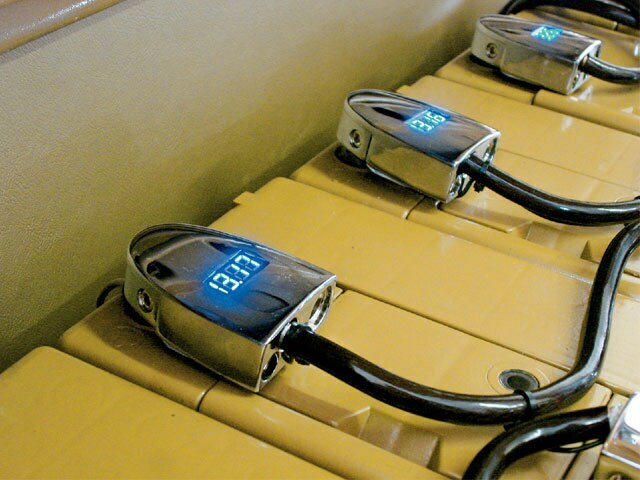 The rest of the trunk compartment received paint throughout, including the six 27-series batteries that were wired with sunami digital readouts. The trunk also received three Rockford Fosgate 8-inch woofers that are powered by one of two Alpine amplifiers. The secondary amplifier powers up the mids and highs in the car. The trunk also received a false plexiglas floor that gives the trunk a bigger feel than it really is. 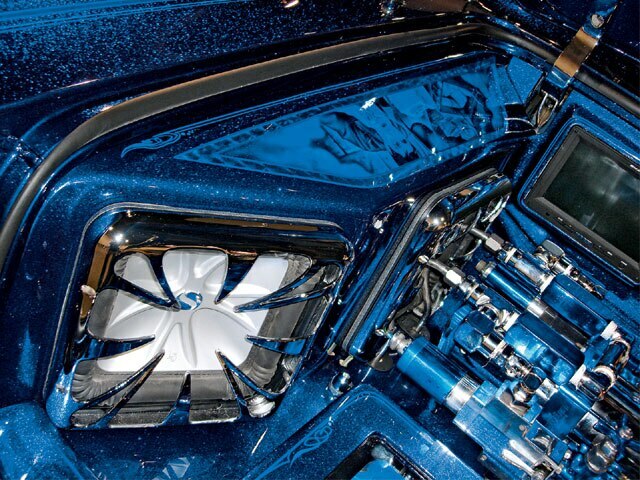 Manny’ Bel Air is one clean ride that we can’t wait to see more of in the pages of lowrider. Keep your eyes open for it as we’re going to be doing a full feature on this American classic. BumpsThe quality of the rides at last year’s las Vegas super show was better than ever, and one that we noticed is being featured in this month’s Bumps section. 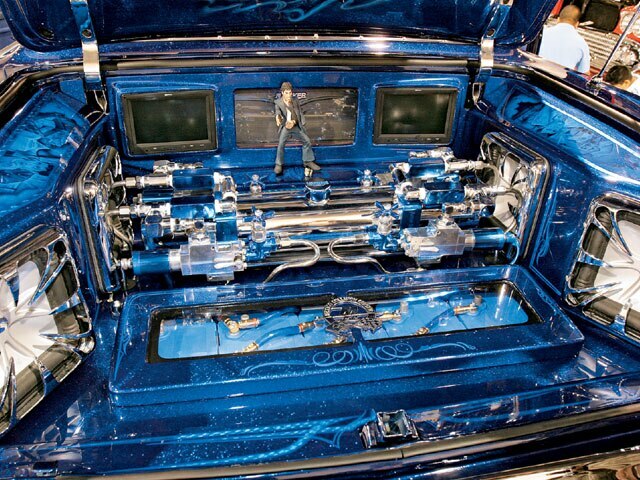 The 64 impala belonging to mexico collision center has it all-paint, engine and, at the heart of it, a custom trunk. Shop owner Javier gave us the run down on how the trunk of this impala was created in 15 days right before the super show. The trunk of this impala received a complete Kicker sound system that features four 10-inch solobaric square speakers. These competition woofers are powered by a 1,000- watt amplifier while a 400-watt amp powers the mids and highs. The complete trunk received custom panels that cover the five Optima blue top batteries. These panels are used to incorporate the two 10-inch woofers and custom speaker boxes. The speaker boxes received murals to tie into the theme that was created throughout the car. “curly” added the pinstripes and silver leaf in the trunk compartment. All in all, this trunk compartment has it all, including a custom whammy tank with #8 slowdowns and monster green dumps, as well as a sound system that booms with the best. This latest creation to come out of mexico collision center is one of their cleanest rides yet. We hope to see a full feature on this custom ’64 in an upcoming issue of lrm. Owner”Big manny”Vehicle’56 Chevy Bel Air ConvertibleCity/StateOrange county,CaliforniaClubSouthside C.C. OwnerMexico Collision CenterVehicle’64 Chevy Impala ConvertibleCity/StateSouth Gate, CaliforniaClubLos Angeles C.C.